For the exceptional deep clean. Fixes the cause of sensitive teeth. Seals teeth and protects exposed nerves underneath. Repairs enamel surface by filling in tiny crevices. Minty fresh breath.The only sensitive toothpaste that fixes the cause of sensitivity by sealing teeth and protecting exposed nerves with patented Liquid Calcium? technology, to provide lasting pain relief. * Baking Soda cleans and whitens more gently. Clinically proven for up to 16 weeks pain relief* * With regular use for 8 weeks. Relief then continues for another 8 weeks. 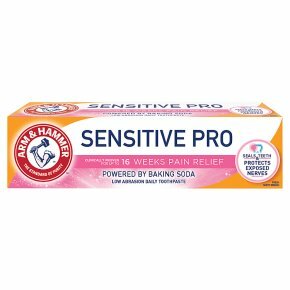 Specially formulated with Baking Soda, nature's clinically proven cleaner mined from Trona (mineral soda) formed from evaporated natural saltwater lakes in Green River, Wyoming, USA since 1867. Directions: Brush twice daily using a soft toothbrush. Sensitivity may indicate an underlying problem which needs prompt care by a dentist if pain persists. Important: This unique formula works best when stored at normal temperature (>20°C) and water is prevented from getting into the tube by replacing the cap after every use. If the product is out of normal room temperature (>20°C), allow it to return to normal room temperature for ease of dispensing.